The Editors : Yesterday one of Roxbury’s most aware and far-seeing activists posted this response to Shirley Leung’s Boston Globe article about uses of the newly rebuilt Ferdinand Building, which when opened soon will completely reconfigure the activity, noise, and social connections of Dudley Square. We of course are big fans of Haley House, the community eatery that is already setting a cutting edge of style and tone for the new Roxbury. “Yesterday morning Shirley Leung from the Boston Globe asked me what I thought of the retail mix proposed for the Ferdinand Building in Dudley. My response: Just read it. I think it’s a bad mix and one that will neither serve the neighborhood nor the tenants. I am happy to see Clover, Parish Cafe group and Shanti. However, I am not thrilled that Clover won out over Haley House. Clover does not currently have a presence in the neighborhood or the loyal following that Haley House has. Additionally, none of the proposed tenants has invested in Dudley/Roxbury the way that Haley House and Discover Roxbury have. The neighborhood is desperate for places that will be open in the evenings and on the weekends – it’s a ghost town after 6 pm – and this municipal building that will be otherwise empty will really need a lively first floor in the evenings and on the weekends to offset the empty floors above. The apparel shop and eye-care place are just wrong for this building – they could go elsewhere in the square. “That is the other point that people seem to be missing – there is a lot of open retail space in Dudley Square, right now! And much more coming online in the next year or so. I would like to see the city be intentional, thoughtful, and strategic about what goes into the Ferdinand – it represents the future of Roxbury. A Starbucks could go in to a nearby spot today and I am not opposed to a Starbucks in the square. If a Starbucks were to go into the Ferdinand, I would want it to subsidize the rent of a smaller, more financially vulnerable initiative and perhaps that is an innovative way to create a mix that will be successful for the neighbors, tenants, and financially. Very troubled by all of the CDC’s present tat the walk, o bend the ear, so to speak, of the new Mayor as he walked the Dudley Square area. CDC’s are not community leaders, albeit they are very active in their own interests, rarely ours, and shouldn’t be seen as ours. Below is a facebook post and reply to my dear Aunt Viola who happened to notice some of the goings on from the WalkBoston tour in Dudley yesterday. @Auntie Vi: You probably wouldn’t recognize Dudley now from the 50’s and 60’s. There’s a lot happening. I credit the mayor for sharing his parent’s experience of Hibernian as a dance hall and his voiced commitment to work on preserving Dudley’s history and its people. But sadly, the context and narrative that could speak to your fond memories of Cape Verdean dances at Hibernian, along with the mayor’s reflections, were sorely missing from the actual WalkBoston tour of Dudley that proceeded the gathering at Hibernian. That’s because the WalkBoston tour was co-opted by the community development corporations that helped sponsor the walk. 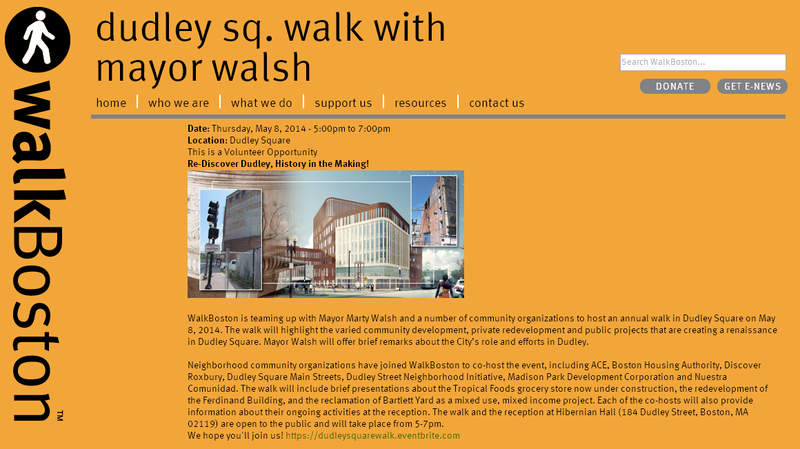 From the eyes of many the walking tour was strategically designed and meant to promote their various development projects in and around Dudley Square. Your comment about “oh the music” speaks to the missed opportunity around art and culture and the transformative power of each to engage and bring us together. To have our account hijacked in the interest of gaining favor with the new mayor to promote the development agendas and interests of a cohort of CDC’s over our interests is unconscionable! I trust the mayor sees this walk for what it was: money and power trying to steer policy! Policy that very often is not the will of the people!